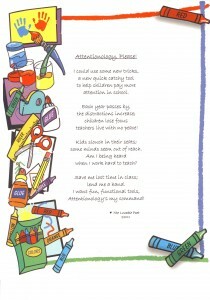 Home » Posts » Attentionology for K-5 Teachers » Pull Kids In with Poetry! Kids get pulled into poetry in a heartbeat when I dramatize a silly Limerick from Ireland as I open up a “Poetry Cafe” in class on “You Choose Writing Day,” like you see me doing in my blog pic below. I’…be awfully sad when it goes. If you share this Limerick with your class, pull in the kids like I do after reading the poem by asking them, “What would I be if I lost my hair?” They’ll scream “B-A-L-D” and laugh at the limerick. Five lines to it – all nice and tight. As a flash here’s the last one in sight. Help your students master this poetic form by noting that in Limericks, lines one, two and five rhyme with each other and lines three and four rhyme with each other. Do all poems rhyme? Of course not, but I’ve discovered that many elementary school children don’t come to class already knowing this. I love to watch eyes light up when kids who struggle with writing hear in my classes that they’ll be free to write free verse – no rhyme – during our week together. FREE…it’s a word that pulls kids into poetry! The diversity of poetic structures offers something for everyone. Joy is in their flight. Sharing poetry with your class from countries around the world is a classroom-tested way to introduce kids to different languages, and to the concept of translation. Children are fascinated by the fact that a poem that rhymes in one language will not rhyme in translation. I share a short rhyme in Spanish and English with my classes to illustrate this concept, as shown below. You can pull your kids into poetry with poems in languages that you want them to master. In US states that have adopted the Common Core Curriculum, teaching poetry has “fallen out of favor” in the guidelines for upper elementary school grades. Fortunately, poetry is still a part of the curriculum for the early grades. One can argue that research suggests that exposure to poetry writing helps form a strong foundation for all kinds of writing. I believe this; my experience as a teacher supports this assertion. As I tell my writing students, “When you write a poem, you paint pictures using words.” The concept of word picture-painting pulls kids in…it applies to writing non-fiction, opinion, fantasy, poetry, etc. What’s poetry’s special pull? It comes from the heart. Kids respond to this concept, don’t you agree. Even very young children understand that some things are personal. The language that adults use to describe what is personal changes to be age-appropriate, but kids get it. Poetry allows us to express ourselves. As I explain to my classes, a poem can be about something we feel, see, think, love, hate; poems may be about someone we care about , somewhere we’ve visited, something we’ve experienced. 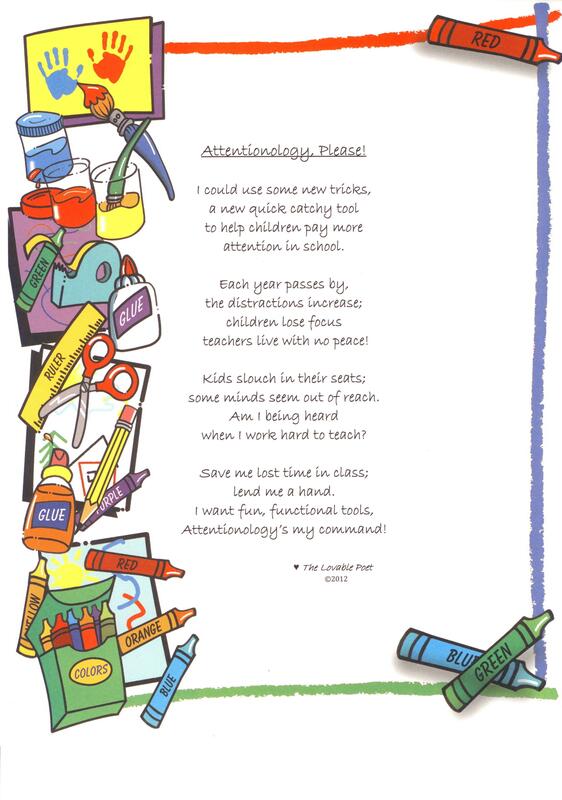 The focus list is endless…another reason why teachers can pull kids in with poetry! What is a dream that inspires you? What is the path to pursue? Let’s explore all that’s in view. Going crazy in your classroom? This poem’s for you. Attentionology, Please! 9 Pings/Trackbacks for "Pull Kids In with Poetry!"